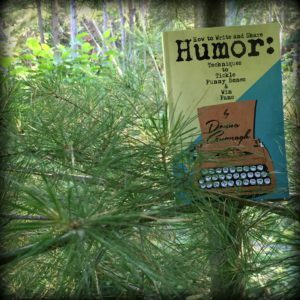 Mainstream publishing may not consider humorists ‘real’ writers and discounts the genre as effortless but Donna, who has written humor for 30 years, disagrees. And she has packed this book with validation and practical tips for those of us who are driven to write humor. Donna remembers when most publications made room for humor, and she was syndicated for five years before the internet and downsizing squeezed her hilarity off the page. She found a few sites that would publish her material, but there was a conservative element that made it difficult to get her adorable round face published in a landscape of square pegs. She channeled her frustration into action and created a website and publishing house where humorists could find a soft place to fall on the floor laughing, mostly free from censorship. She named it Humor Outcasts and had no idea how far-reaching HO would become, casting an interesting slant on the chosen name. 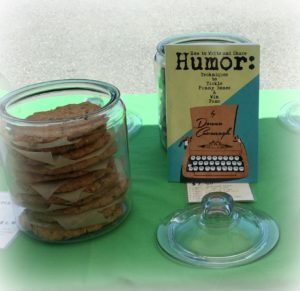 Donna believes humor is an essential part of life and shortly after the release of “How to Write and Share Humor,” she announced that all royalties would go to support HO. When she asked fans to buy a book and recommend it to others she didn’t foresee the launching of a world book tour. 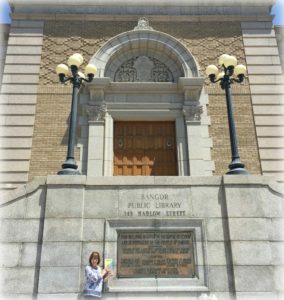 Since I love the book, HO and Donna’s mission, I volunteered for the #SummerofHumor tour of Bangor, Maine. 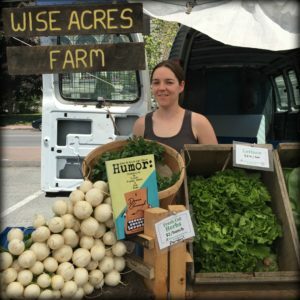 Shirley was not enthusiastic about going to the farmer’s market for fresh vegetables but relaxed when she was able to make some wise cracks at Wise Acres farm with Brittany. Unable to survive on wise cracks and kale, I bought her a chocolate chip cookie the size of a dinner plate. I wanted to wait until The Bangor Public Library was open but after eating the giant cookie, Shirley’s ability to delay gratification was at an all time low. 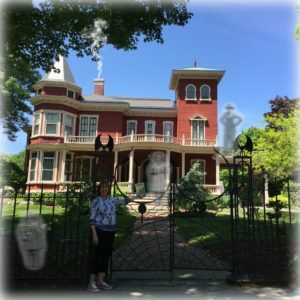 I thought Shirley was shaking with excitement when we visited Stephen King’s house but later when cropping the photo I realized she was indeed terrified. How many ghosts can you find? 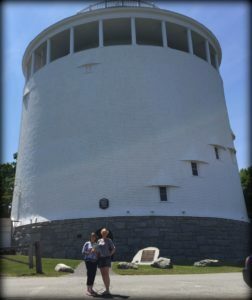 When we visited the Thomas Hill Standpipe, used historically as a water reservoir and the famous home of Stephen King’s ‘It,’ we met a German reporter who interviewed Shirley for a piece she was doing for Deutschland Radio Kultur (the equivalent of German public radio). She asked Shirley to identify Bangor landmarks that coincide with Stephen King’s fictional town of Derry. The interview was frightful since Shirley couldn’t find her way out of a cushioned envelope. 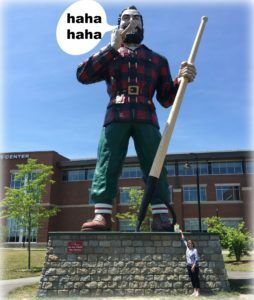 Paul Bunyan thought Shirley was hilarious and I don’t think it was because she tickled his foot through his giant boot, but you never know. 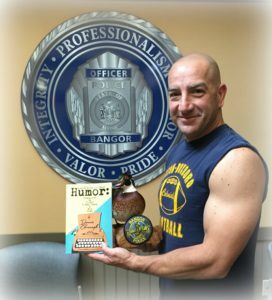 We stopped to see the Duck of Justice at the Bangor Police Station and even though Sargent Tim Cotton, a past Erma Bombeck writer of the month wasn’t available, officer Rob Angelo delayed his departure for the gym and posed for a picture. He apologized that he wasn’t in uniform, but Shirley didn’t complain. I’m not making any judgements about her morals, but she kept slipping out of my hands to prompt officer Rob to pick her up. 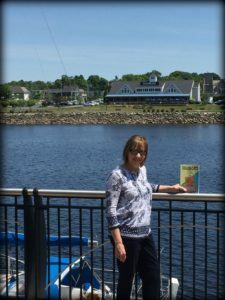 We took a stroll along the Penobscot River. Unfortunately, the cookie was long gone and Shirley overlooked the scenery to focus on a lobster dinner at the High Tide Restaurant. I told her lobsters were out of season and she believed me. Shhhh…don’t tell Donna that Shirley is this gullible. 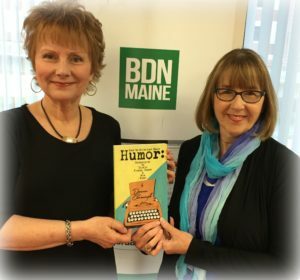 Our last stop was at the Bangor Daily News where we met fellow Humor Outcast writer, Roxanne Jones. Shirley was impressed that the BDN makes room for humor writers. Later while Shirley napped, I took a sneak peek at her passport and discovered that “U” stands for Ultimate. I have to agree, Shirley U. Jest. You are the ultimate book for humor writers. Awesome job Molly as HTWSH’s excellent tour guide of Bangor! It was such fun Donna. You are welcome in the Queen City any time! Thank you, Molly, for this re-view. Donna’s book has taken me to places I never would have gone otherwise. I know, Bill. I have so enjoyed her book’s world tour this summer.